Okay, so this really doesn't have too much to do with my kids, but here it is anyway. I'm a huge fan of Disney's High School Musical movies. I'm a huge fan of musicals in general! I've been a theater junkie since age 5 when my parents took me to see Peter Pan starring Sandy Duncan at the Pantages Theatre in Hollywood. We sat in the back row in the highest balcony as far from the stage as you can get without being outside, but the magic pixie dust of live entertainment still made it's way up to my seat. I was smitten. More than smitten, I was obsessed. I can recall that matinee show with perfect clarity, including the intermission when I looked up at a bored usher and told her I wanted her job when I grew up so I could be around the theater all the time! My parents saw this love of theater blossoming within me, and despite several lean years, they always managed to find money to take me and my little brother to see professional theater, most often at the Glendale Centre Theatre in Glendale, CA. Bit by the acting bug for awhile, I did several shows in Jr. High. And then the first day of high school, my family moved to a rural community. I had a choice between two high schools. One held their drama productions in the cafeteria. The other, in a California State Historical Landmark theater built in the 20's. You can guess which one I chose! Of course, it was there that I discovered something better than acting... stage managing, directing, and finally playwriting. I left small town life to go back to Los Angeles for college, where I majored in theater and met someone who loved theater as much as I, my husband Michael. Together we have our own production company that does project management for all forms of live entertainment. Every day I realize more and more how unusual it is to fall in love with something at age five and then get to be doing that very thing for a living, three decades later! Of course, once the kids came along we introduced them both to the theater early and often. They are frequently wild and unruly boys full of energy to spare, but never in a theater. They sit quietly, laugh and clap during appropriate moments, and are very respectful of all the people around us (who always comment on how well behaved they are). But best of all, they are as enchanted by the stage as we are. So when the three High School Musical movies came along, the entire family gathered round to watch them and enjoy them. They are light and fun, with just the right amount of drama and the bratty teens gently get what they deserve in the end, just in time for a big closing musical number. What's not to love? The best thing is how the movies created a cultural movement for teens and tweens to start seeing and performing musical theater! I'll advocate anything that expands this particular art form! Most girls who see the movie promptly fall in love with the lead character of Troy Bolton, played by Zac Efron (currently on the big screen in 17 Again). But not me. I think the singing, dancing, acting, and plaid sweater-vest wearing Ryan Evans, played by Lucas Grabeel, steals every scene he's in. He's totally my favorite, as embarrassing as it may be to even have a favorite from the HSM movies when you are a woman in your 30's. 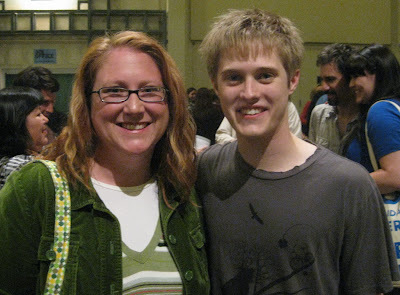 My amazing husband knows Lucas is my favorite, and he indulged me by managing to score some great seats for the preview of the musical The Fantasticks, starring Lucas Grabeel, playing at the Freud Playhouse at UCLA through May 17th (tickets available here). The show was directed by Jason Alexander of Seinfeld fame, and also starred Eric McCormack from TV's Will and Grace. And it was truly fantastic! But the best part was after the show when I mustered way more courage than I felt and walked up to Lucas and had a little chat with him. Of course, with my nearly transparent pale skin prone to blushing, I immediately turned a deep shade of purple for this lovely conversation! And then my wonderful husband snapped our photo and off I floated to the car, feeling as starstruck as my teenage friends who saw the photo on Facebook and declared me to be the luckiest girl in the world. And I am. In more ways than one! I grew up with the love of musicals as well, and watching this series with my 5 year old daughter (my one wish is that HSM will help create a new generation of fans of the musical), I instantly was drawn to the character of Ryan, hoping Lucas Grabeel makes his way to stage, where is talents could fully be used. He is by far my favourite (yes very hard to admit as a 30 something lol). I hope that one day he can work his way North, so I too can see him on stage, to see if my initial reaction of his stage potential was correct. Janet- Lucas was clearly very comfortable on the stage. He was quite natural with the singing, dancing, and physical comedy the role called for. I asked him if he'd like to do more stage productions and he said he would. He said he started out on stage before he tried to make it in TV and film. Here's hoping we'll get to see more of this multi-talented actor on the stage very soon!